We’ve considered some fairly minor mishaps involving ChessBase & Fritz databases in the past couple of blog posts. Today we’re going to look at the type of database error which no chess database user ever wants to see: the major catastrophe caused by a seriously damaged database file. If a database suffers that kind of major disaster, you’ll know it. You’ll see blocks of “Data error” entries interspersed throughout the database’s game list instead of normal game header information (such as the player and tournament names); in severe cases you’ll see every entry in the entire database appear as “Data error”. You’ll try to perform searches or other large database operations and get error messages. Believe me, in most cases you’ll know it when you have a major database problem. 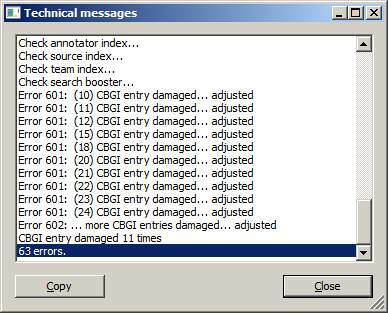 The good news is that ChessBase 11 can attempt a repair operation on a damaged or corrupted database. The software can at least attempt to fix the errors it finds. This is never a guaranteed fix; some databases are just so badly damaged that they can’t be repaired at all. Speaking from my own experience, it’s seldom possible for ChessBase 11 to recover 100% of a damaged database but it does a good job of salvaging the majority of damaged games in a corrupted database. …and that is why we looked at the procedure for backing up your databases several posts ago. 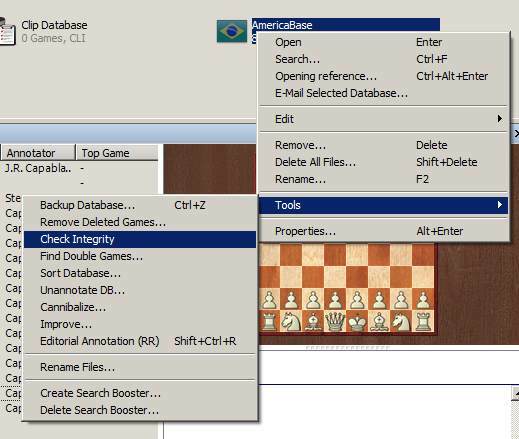 ChessBase 11 is potentially going to make major changes to your database; afterward, if you don’t like the changes, you can always restore your database from the backup. “But the database is damaged anyway!” I hear you saying, and that’s true for this example. However, you can run “Check integrity” on any database at any time just to check for errors (to ease your mind if nothing else), and this is why the software asks you if you’ve made a backup of the database. I’ve said this before and I’ll doubtless say it again: it’s always a good idea to make regular and frequent backups of your databases (for a whole lot of reasons, as we’re discovering over the course of these several blog posts). Click the “Yes” button in the dialogue illustrated above and ChessBase 11 will begin the process of checking for data errors and correcting those that it can fix. 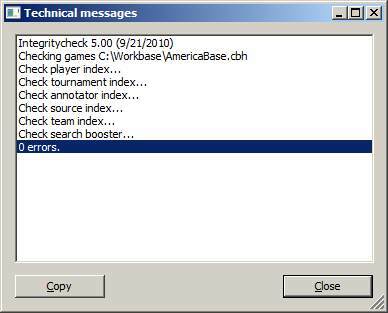 Since the integrity check feature was first introduced to ChessBase software several versions ago it has steadily improved. Early versions really didn’t do much more than rip out the damaged games. The present version does a far better job of salvaging the damaged material. It may not be able to save every bit of information from a damaged game (some annotations may be lost, for example) but at least the game itself is preserved.